Now that the shearing of sheep’s wool has taken place across the islands we thought we’d share the ten steps required in turning this 100% pure new wool, freshly washed and scoured, into the fabric we know and love, Harris Tweed. The journey begins with huge bales of clean, white, 100% pure new wool arriving at the Harris Tweed mills ready to be dyed. Harris Tweeds unique quality and character is firstly borne out of the wool being dyed prior to it being spun, as opposed to dyeing the wool post spinning. This means different coloured wools can be blended to create a myriad of intricate shades and hues. 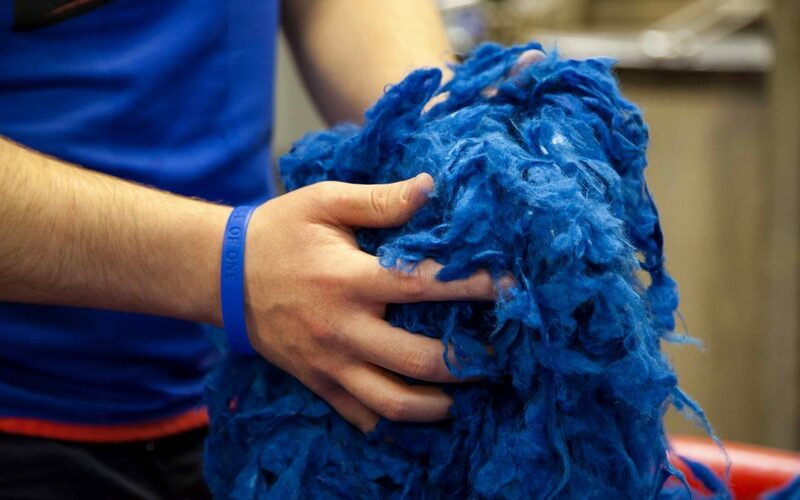 After dyeing in steel vats, the emerging wool must then be dried using a simple combination of spin drying and tumble drying in warm air to remove the remaining moisture. Blending. With a stock of basic colours now to hand, the work of blending to create an almost infinite variety of potential shades of yarn begins. From just a few dozen colours, almost any natural hue can be created. The base colours are often very vibrant and reflect aspects of the local landscape or its fauna. It is practically impossible to distinguish Harris Tweed from the land that has become its source and inspiration. Carding, the process by which the individual wool fibers are individually straightened and sorted into separate fibres. Over a series of stages, this process converts a continuous matted web of fibres into individual ribbons of fine threads. The machine (or, technically, series of machines in one long process) mechanically mimics the effect of hand-teasing and carding using spiked wooden paddles. Now that the base colours are fully mixed into the desired shade, and carded into the right consistency, the fibre is ready for to be spun into yarn. Spinning. For the yarn to have the strength required for weaving, it now needs to be spun into strong thread. The spinning is literally that – twisting it around 6-8 times giving the yarn a great deal more tensional strength. The loose threads from the previous stage are wound onto a long bobbin and the yarn is gently pulled from here, down through a twister and onto the yarn cones below. Warping. The Warp is the long, lengthwise group of threads in weaving, through which the crosswise ‘Weft’ threads are interwoven to create its pattern. The warpers use a special warping frame which needs enough pegs for the longest warp to be strung between them without a break. Once hundreds of warping threads have been laid out for the full width of the loom, where it will be woven (which may be either ’single’ or ‘double’ width) they are wound up into hanks or onto beams, and sent out to the weaver’s cottage, ready for the weaving itself. Weaving. By statutory Act of Parliament, the weaving of Harris Tweed may only be done within the homes of the islanders in the Outer Hebrides. What’s more, no automation is allowed. To this day, every inch of Harris Tweed is produced by human power alone using simple pedals to drive the loom mechanisms. The warp and yarns for the weft arrive from the mill, and then the weavers set to work. Darning. The woven Harris Tweed fabric comes back to the mill from the weaver where the first task is to check it for any imperfections. Every inch is carefully scrutinised on a light table and any broken or stray threads are darned and mended. Washing & waulking. The Harris Tweed cloth is nearly ready. It just needs to go through a few final processes. The first is to give it a good wash, to remove all remaining impurities and oils using cold water. Then comes waulking, or beating of the cloth, which has two important effects. Firstly, it cleanses the cloth and eliminates excess lanolin, oils, dirt, and other impurities. Secondly, it makes the material softer and thicker. Drying and pressing of the tweed. Before the Harris Tweed can be sent to the customer, it needs of course to be fully dried. It also needs to be pressed so that it arrives in perfect condition. Afterwards, the entire piece is checked over, once again, inch by inch. There is one final, all-important step, before the Harris Tweed can be dispatched. It has to be certified by the official Harris Tweed Authority inspector, before it can carry the Harris Tweed Orb trademark label. He visits several times a week, and for each piece of fabric, examines the certifications that proves each requirement of the Act of Parliament have been met. Now the cloth can truly be labelled, Harris Tweed where it is shipped from the shores of the Western Isles directly into shops and homes around the world. A truly great fabric with a truly great history!